Mom and I love taking a drive up scenic Route 6 to the Cape when the summertime weather is at its best. Today was one of those days. The sun was shining, the air was breezy - it was awesome. The only thing that we could think of to improve our drive was a box of pastry. Of course, now that we've become food snobs, we can't just eat any old Dunkin' Donut or stale party cookie from Stop & Shop. We have to have fresh, homemade pastries. Luckily for us, we found those things at Gail's Goodies & More, located right on Route 6. We pulled into the gravel parking area at 4:20 p.m. Check out the 3D cupcakes popping off the sign. LOVE IT! 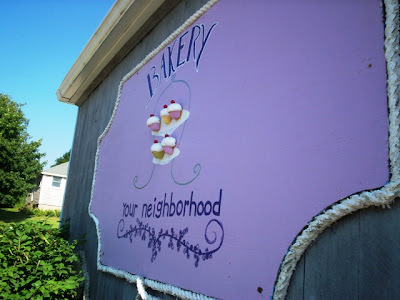 We'd never been to Gail's before, but when we stepped inside the small bakery, we knew what we were in for - homemade goodies! The entire waiting area was filled with the aroma of freshly baked cookies and just brewed coffee. A small cooler filled with assorted meat pies and casseroles stood next to a metal rack which held a variety of bagged cookies and breads. 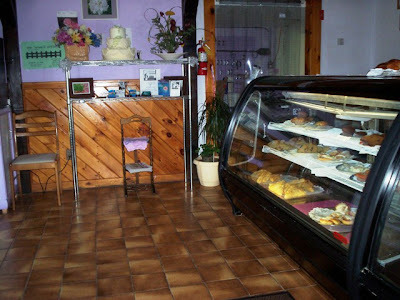 At the center of the store were two large display cases which featured all of Gail's Goodies. There were tarts, brownies, turnovers, cupcakes, muffins, danish, cream horns, and a few other things. Unfortunately, I wasn't able to get a good picture of the cases because the girl that was waiting on us was standing right behind them. At least I was able to get a shot of the adorable purple decor. Both Mom and I - after seeing the desserts - had no idea what we wanted to buy. At first we were a little disappointed that Gail's didn't have more items available, however, we realized that it was an hour and a half before closing time, and since everything is made fresh, we were pretty sure that whatever was out was whatever that was left over from a busy day of feeding hungry customers. When we finally decided what we wanted, the friendly cashier proceeded to fulfill our request. 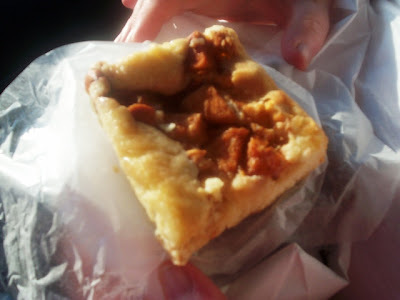 We chose an apple square ($1.75), a bag of six chocolate chip cookies ($3.50), and a cream cheese brownie. Our total came to $7.22. Before leaving, we took a business card with us and took it home so that we could check out their Web site. 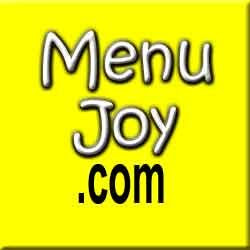 After reading the site, we realized that they serve many flavors of pies (apple, blueberry, pumpkin, Boston cream, strawberry, cherry, chocolate cream, lemon meringue, and key lime), breads (whole wheat, French baguettes, traditional white, multi grain, and ciabatta), and ciabatta stuffers (French meat pie, chicken and broccoli, vegetarian, buffalo chicken, and fillet of fish). Gail's also creates wedding, birthday, and party cakes for any occasion. After leaving Gail's, we headed down Route 6, picked up a couple of drinks, and parked the car in Bourne at the Cape Cod Canal Railroad Bridge. As Mom and I tried to figure out how the trains get from one side to the other (the top part lowers down - duh), our yummy treasures started calling our names. Naturally, we grabbed the bag and dug in, and took whatever was left home with us to have the next day ... or later in the evening. The chocolate chip cookies were excellent. They had a great homemade taste and shape (kinda squarish). 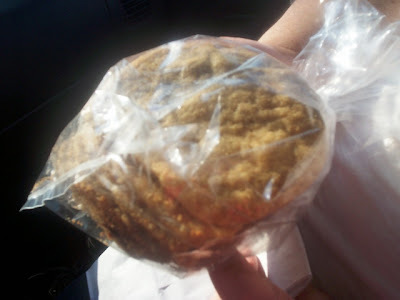 The large cookies were crisp on the outside, yet moist and chewy on the inside. The chocolate chips had even melted a little, making it perfectly ooey-gooey. They would be excellent paired with a cold glass of milk. 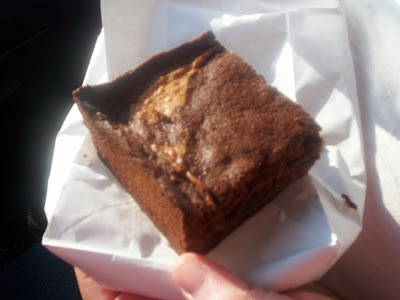 Both Mom and I could actually taste the cream cheese in this cream cheese brownie. It broke up the density of the batter and made the texture more like soft cake than a fudgy brownie. The flavor was deep and rich without being too chocolaty. This apple square turned out to be one of our new favorites! It was a lot more moist than we thought it would be, which was probably due to the fresh, real apples scattered throughout the square. The top crust had a nice glaze to it, and we almost felt like we were eating a fresh piece of apple cake rather than an individual pastry. We definitely look forward to trying the other flavors. 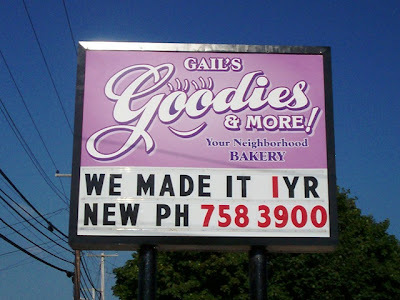 According to their sign, Gail's Goodies & More has been in business for one year. Both Mom and I hope that they stick around for many more, and we'd love to go back and try some of their other desserts and pastries. We'll be sure and visit in the morning the next time. You know what they say, the early bird catches the ... pastry? Gail's Goodies & More is open from 6 a.m. to 6 p.m. Monday, Tuesday, and Thursday through Saturday. They are open from 8 a.m. to 2 p.m. on Sunday, and they are closed on Wednesday.